If Touched by Autism wins Saturday's Grade 2 Palos Verdes Stakes, there will be more than one feel-good storyline. First, even though only seven horses were entered, it would be the upset of upsets, since Touched by Autism will be the longest shot in the field going six furlongs in the Grade II sprint for older horses. Second, it will draw deserved attention to autism, a pervasive neurodevelopmental condition affecting a person's ability to communicate and interact with others. People with autism may have a difficult time understanding “typical” social cues and social behaviors, and they may face challenges engaging with those around them—either by using words or non-verbal behaviors. Affecting one in every 68 people in the United States, autism is one of the fastest-growing neurological disorders in the world. There is no known cause and no known cure. It infinitely tests the patience and endurance of every family in which it surfaces with an impact that is all-consuming. It is a life sentence with no possibility of parole. Picture Dustin Hoffman in Rainman. He can tell you how many toothpicks fell on the floor but he doesn't know how much a hot dog costs. 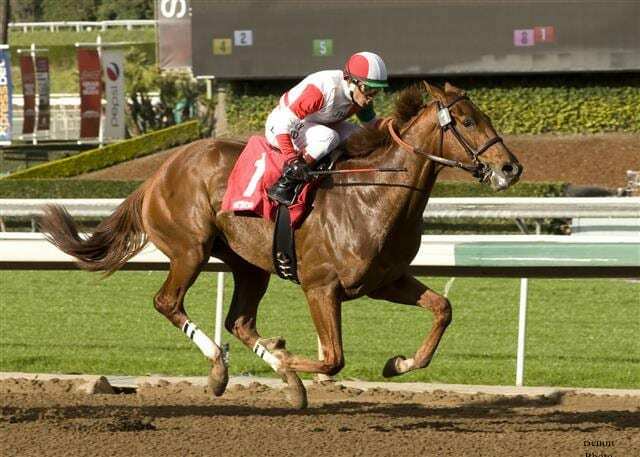 Johnny Taboada owns Touched by Autism, a six-year-old California-bred son of Beau's Gem, who has won eight of 29 career starts, including the restricted Oakland Stakes at Golden Gate Fields last Nov. 24. His odds were 13-1. As for Touched by Autism, Stolz, 41, a former jockey, says the horse is “feeling good, but we've been trying to stay at Golden Gate and run because it is so tough down south. An off track wouldn't necessarily hinder Touched by Autism, since he broke his maiden on a good track at Santa Anita going a mile on Jan. 7, 2016. “It had been pouring rain sometime before that race,” recalled Storz, who was born in North Carolina, raised in Maryland but left when she was 10 when her father came to California to work for NASA circa 1985. She got her trainer's license in 2015 and has 25 head currently at Los Alamitos. Taboada, a native of Peru who has been in the United States for more than 25 years, resides in Pleasanton and is a senior loan officer and a mortgage consultant in addition to currently owning “about 22” horses. But the 40-something owner has learned to challenge the odds. “We know we're over our heads in the Palos Verdes,” he said. “Ideally, we didn't want to enter, but we wanted to take this opportunity based on how well he ran in his last two sprints. “If we can be in the mix, it would give us something to look forward to in the future. It's the old story, 'You can't win if you're not in.' We know we're going against the best of the best—the best in the world, really. The Palos Verdes is not about winning or losing a race however; not about material success. It's about love and concern for family. It will not alter Taboada's priorities. He will always be “touched by autism,” devoted to the well-being of his own flesh and blood and a malady that in a negative sense afflicts and in a positive sense attracts, as if by a magnet. Although autism has no template, Renzo is the tie that binds. This entry was posted in NL List, Racing and tagged johnny taboada, marcia stolz, Palos Verdes, roy h, santa anita park, touched by autism by Ed Golden/Santa Anita. Bookmark the permalink.